"If I could be reborn to live a different life as a non-photographer, I might choose to be Katy Homans. One of the most influential and accomplished photography book designers of the last thirty years, Homans has worked extensively with Lee Friedlander; she hasn't designed all of his two-dozen-and-counting monographs, but a majority of them bear her name on the colophon. Homans designed America by Car. Just imagine the pleasure of feeling confident in suggesting to the artist that the endpapers and free flyleaves of his next book should be in several pearlescent shades of luminous automotive paint. 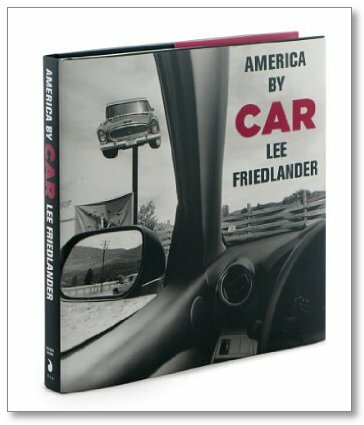 And that those pages should also bear, in bold contrasting colors, Friedlander's chosen quotes and lyrics -- the epigraphic, sometimes enigmatic material that takes the place of lengthy curatorial statements in most of his books. And then imagine being able to mold a delirium of images into another entry in perhaps the singular catalogue of contemporary photography monographs. Not a bad gig for a designer."